Audio Comparer - Great job! "Hi there! Guys, I'd like to say thanks for a really good program for me! It's a first aid for my music collection, because it's really gigantic! Audio Comparer managed to organize several thousands of audio files - all having different audio formats! Absolutely bang-on! Great job! Recommend the program to all music fans!!!" Download Duplicate Video Search app to get rid of real hard drive space eaters! Remove duplicate video clips, either identical or converted. With the Audio Comparer, you'll soon be organizing your digital audio collection faster than you ever dreamed possible. Using unique recognition technology, Audio Comparer doesn’t just scan your files; it actually "listens" to them and is capable of comparing different audio files note for note. You will never experience the hassle of duplicate files again! Find and remove duplicates automatically (optional feature). Identify music regardless of format or missing tags. Root out files that have been misnamed. Organize files into trees based on similarity level. Create audio groups for refined analysis. It's been years since the last time you bought an album on CD. Sound familiar? These days, music has been completely digitized, and we acquire most of it by downloading files from the internet. This method of collecting music is both quick and easy. However, convenience has its drawbacks. For example, when more than one person shares the same computer, duplicate files are often generated when multiple users download the same songs without the others knowing. 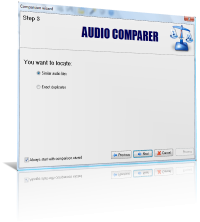 Windows XP/Vista/7/8/10 users — give Audio Comparer a try today! Able to work with MP3, MP2, MP1, WMA, AIF, WAV, WavPack, FLAC, APE, AAC, and OGG, the Audio Comparer offers unprecedented file comparison abilities. Unlike other duplicate MP3 finders that are designed to scan for tags or file size, the Audio Comparer actually "listens" to the songs themselves analyzing and recognizing them based on their sounds – just like the human ear. No matter what codec or bitrate your files are saved as, the AC can identify the duplicates. Audio Comparer begins by listening to your entire music collection; every format; and remembers it all. You can choose to have AC view your files as one big audio collection, or you can divide your music content into smaller groups. Compared to the time you'd spend doing the same thing manually, you'll be blown away by how fast the Audio Comparer is. In fact, it takes only a second or two to "listen" to an entire MP3! Equally as quick is the audio comparison process; you'll begin to see results within seconds. The results will be displayed in a tree layout with branches connecting files based on the degree of similarty within each parent branch. Have duplicates in your iTunes library? Audio Comparer can find and remove them automatically. Does your collection include lots of different audio formats, codec, and bitrates? Audio Comparer can sort it all out. Do you have audio files with missing tags? Audio Comparer is the only tool capable of identifying and removing tag-less audio files. Operate a broadcasting station? Produce a podcast? Avoid accidentally playing misnamed audio files at inappropriate times. Feeling like your collection takes up too much space on your hard drive? Audio Comparer will help you get things under control in no time at all. 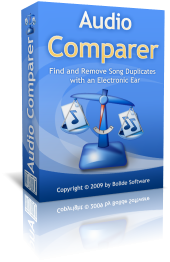 Equipped with the same award-winning "observing" technology as our duplicate image finder tool, the Audio Comparer is the only tool you'll ever need to search for audio duplicates. See for yourself how amazing this utility can be through our 30-day free trial version. There are a few limitations; you will not be able to copy, move or delete files using the trial version and sound files need to be over 90 seconds, but you'll get a firsthand look at how the program works. You can activate its full potential at any time by purchasing a license. You may also check the Video Comparer tool. Are you a blogger? Post an Audio Comparer review to your blog, and we'll provide you with a license for free!